Have you ever watched the end of an underwater natural history programme on TV, and seen the ‘making of’ section? It’s where the producers give you a view of how some of the documentary was filmed. Videographers are realising that freediving is the key to capturing footage of some of the larger creatures that move between the depths and the surface. I have watched many of these tail ends, and yet I still haven’t seen one where the camera person is making the most of their freediving potential. If they did, they may be able to spend hours or days on a shoot, instead of weeks or months. An extra 30 seconds underwater can make all the difference between a brilliant sequence and nothing but blue water. The same philosophy applies to the stills photographer. Underwater photographers typically learn their art on SCUBA equipment, and it’s a common opinion that SCUBA diving is much more advanced than freediving. As a result, not all would-be freedivers with SCUBA experience go to the trouble of taking a training course, or even reading a training manual on the subject of freediving. The argument for doing this is (at least in part) a series of common myths. I have picked out what I believe to be the top 10 of these, and taken an alternative view, based on my experiences of freediving and SCUBA. I’d be more inclined to suggest that wearing a pair of long-blade fins, if unfamiliar with using a newly purchased pair, makes you fully equipped for experiencing calf cramp! Unlike their SCUBA cousins, freediving fins come in different stiffness grades for different physiques. Buy a pair that are too stiff, and your legs won’t thank you. Of greater significance, is overlooking performance gains from using the full armoury of freediving equipment available. An open-cell freediving suit will ease your progress through the water, a ‘Marseilles’ weight belt will allow you to breathe more deeply, and the correct snorkel type will minimise drag. Some items only add minor benefits, but when combined, the sum of the various parts can make a substantial difference. Anyone who holds their breath underwater introduces the risk of shallow water blackout. Anyone who experiences shallow water blackout on their own dies. There are very, very few exceptions to this. This is reason enough to freedive in pairs, but there are numerous other benefits that another pair of eyes and hands bring. The old counterargument here is, “I don’t hold my breath long enough or dive deep enough to experience black out”. Similarly, the Russian roulette player could argue, “I don’t put enough bullets in my pistol for it to fire each time”. I never have time to update my status on Facebook, yet I do seem to make time to eat my breakfast in the mornings. We make time to do the things that need priority. We all know the benefits of stretching muscles before use, and reducing the likelihood of injury. But did you know that certain stretches can help with equalisation? Or that breath hold pre-conditioning delivers benefits for up to 10 minutes or so? If you are bouncing around in a RIB on the way to somewhere and you need to get into the action quickly, I appreciate there’s a challenge…but equally there is always a compromise, to whatever degree. Attend a freediving competition, and you may change your mind on this. Most pool-based competitions (did you know that the majority of freediving competitions are held in swimming pools?) have a ‘static’ breath hold discipline. You just hold your breath for as long as possible. The ‘dynamic’ discipline means swimming as far as you can in distance. You would expect the athletes with the longest breath hold times to be the longest distance swimmers. Occasionally that happens, but most times not. The best dynamic athletes just have the most efficient style and performance. And here’s the rub – breath hold ability takes time and gradual improvement. One aspect of bad style can often be corrected in an hour’s training session, and bring about significant improvement. From what I see of our wildlife photographers on television, there’s plenty of technique improvement possible for the vast majority. To send you to a watery grave, yes. Remember that shallow water blackout I referred to earlier? Hyperventilating makes that process a whole lot easier. It’s all about ‘blowing’ carbon dioxide out of the blood stream, and relaxing the urgency to want to breathe. At the same time, a number of other physiological processes happen, which reduce the amount of oxygen reaching the brain. So add the two effects together, and the lights can go out while you may think you are well within your comfort zone. Unless of course you want something to attach a dive flag to, deposit your snorkel inside (if the float has an inside), rest on after your dive, attach a weighted line to so that you dive downward in a straight line, or simply increase your visibility to your boat cover. Perhaps I’m cheating here – I must admit I haven’t actually heard anyone saying this, unlike most of the other myths. But from what I see, most inexperienced freedivers either don’t wear a belt, or more commonly don’t attach enough lead. They then use most of their energy fighting buoyancy throughout the dive. It’s probably another overspill from SCUBA diving, where experienced SCUBA divers wear as little lead as possible. I certainly don’t advocate overweighting, but the more neutral you attain your buoyancy, the more efficient your forward motion. Of course, adding lead isn’t the only solution – a little more depth will reduce buoyancy, as will a little less air in the lungs (with the emphasis on ‘little’). But you should be wearing a wetsuit, and therefore some ballast will be necessary. Body builders who refuse to wear wetsuits – you win the argument in this instance. I think it’s fair to say that most of us overstep the mark here now and again, and get closer to wildlife than we should. The wildlife documentaries don’t set a good example, especially the sensationalist ones where we see the presenter wrestling with a large reptile. Just getting into the water and entering a wild animal’s territory is having some form of impact, so none of us are squeaky clean. I try to adopt the principle of the 3 R’s – Research, Regulations, and Respect. There’s no excuse for not finding out about the animal you are studying or filming, and I believe (or hope) that most of us do at least some research beforehand. But what are the legal regulations and recommendations about your presence? These should be observed too, as they are there for good reason. Beyond these two principles is the straightforward respect and commonsense we should apply. One particular type of image I am seeing now and again, is that of an oceanic shark with a freediver dangling from its dorsal fin. Has the shark given out a secret signal to say they would quite like to do this? Is there a hidden benefit to that particular shark, or the species as a whole from this activity? Or is it just ego and bravado on the part of two humans, encouraging others to do likewise until the inevitable accident occurs, and a retaliatory cull then ensues? Before you interact with wild creatures, ask yourself a few questions, and make sure you have good answers. Not to avoid fines or jail sentences, but in the interests of protection and conservation. SCUBA diving causes nitrogen to dissolve into the blood and tissues, and takes some hours after the dive to be completely eliminated. You SCUBA people know this; it’s why you don’t fly until your dive computer clears. However, you can quite happily dive again an hour or so after your first SCUBA dive. This is because the dive tables and computer algorithms take into account your previous compression, and apply a penalty. 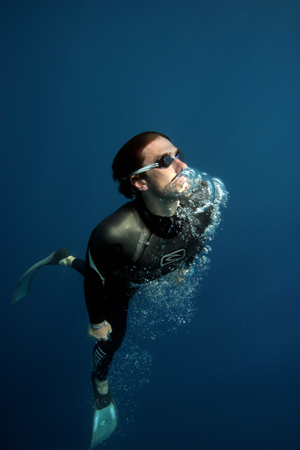 There are no freediving tables (at least not yet), so the act of recompressing by freediving is not possible to assess. But it is certain that you won’t be doing a 3 minute safety stop at 5 metres on your freedive, and that you won’t be making a slow ascent either! If you have been on a liveaboard in the past, mixed SCUBA and freediving, and avoided decompression sickness…count yourself lucky. If nothing you have read so far has been unknown to you, even then I would recommend being properly trained in freediving. You have the opportunity to gain recognised certification, have your technique analysed and corrected, gain full understanding of safety aspects and issues (I have only scratched the surface here), and meet other like-minded people. You might even have fun as well.